These spammers never stop! At the moment people are being inundated with ‘job offers’ from Wilfred at eurojobscouk.com. We have nothing to do with these scammers. We do NOT send out email. Period. At little bit of sleuthing reveals that Chinese spammers seem to be behind all this. They registered this scam domain when the complaints started flooding in on the 16th. The site is registered through www.bizcn.com, who have a Xiamen Cyber Police button on their website. If you can read Chinese, log a complaint with either of them. The chance that they will act is minimal as there are scores of complaints about them as well. They don’t seem to respond to any complaints. It looks like ICANN is the only organisation that can stop this malarky as bizcn.com is accredited by them. Send ICANN a strongly worded message about this as they are responsible for giving Bizcn.com their accreditation and have the power to revoke it. For more info about fighting spam go to abuse.net. You can also ask your email provider to implement the Sender Policy Framework, which should stop the majority of spam. This recognises if the sender realy is the one they claim to be. 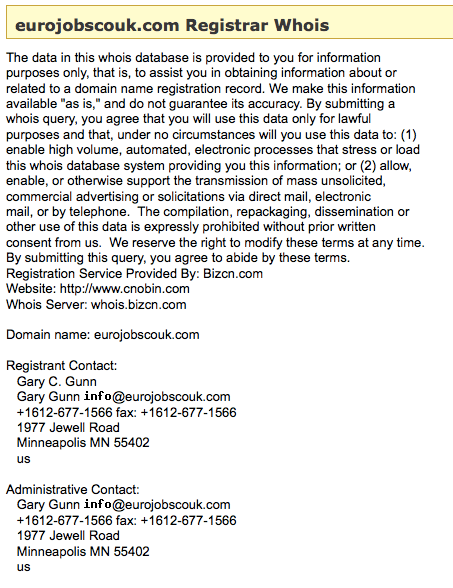 In this case the alleged sender is eurojobs.com, but based on the ip address the message came from, it’s not. If that is the case SPF will simply bin the message as spam. If you can’t read Chines, set up a filter in your email program for the content of the spam message. 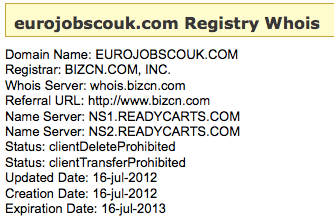 Enter ‘eurojobscouk.com’ in the filter for the bodytext, set it to delete and forget about it. The following instructions will allow you to create filters for your email client which will automatically move or delete incoming messages with certain characteristics. These instructions assume you have already set up your Personal Folders for local storage of mail. From the Rules Wizard window, select the New… button. The default of “Check messages when they arrive” is fine. No need to change anything. Next, in the lower part, under Rule description, select the link named specific words. Type in eurojobscouk.com or what ever appears in the spam message. In the Search Text window, to the right of Add new, enter the exact words which are in the body of the messages which you want to filter. Now select the Add button, and the words you entered should appear in the Search list area. Select the OK button to continue. Back in the Rules Wizard, your subject line string should be in the Rule description pane. Next, in the lower part, under Rule description, select the link named specified. Select the New… button if you need to create a new folder for the messages. Otherwise choose an existing folder under Personal Folders or choose Delete it and skip the next step. Give the new folder a name, then select OK. Whether you created a new folder, or chose an existing folder, now select OK.
Back in the Rules Wizard, your folder name should be in the Rule description pane. Select Finish. If you were to choose Next, then you could add some additional restrictions to the filter. But right now, we don’t need to do that. You should now be back in the first Rules Wizard window, with your new filter in the top pane. Select OK to finish. All incoming mail will now be subject to the new filter as long as the Outlook client is running and logged in. To filter the messages which have arrived when the client is off, you must manually execute the rule from within the rules wizard. This entry was posted in Articles, Scam & Spam and tagged eurojobscouk, scam, spam by Harmen Rijks. Bookmark the permalink.